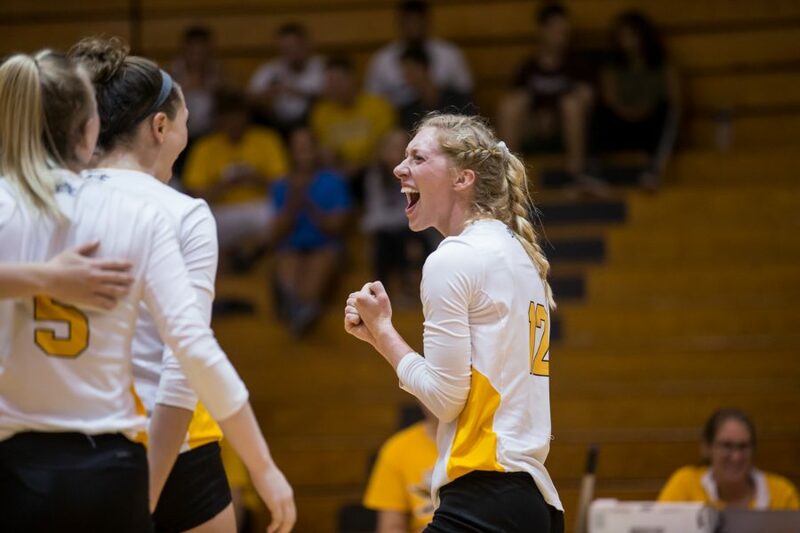 The NKU women’s volleyball team continued their winning streak Wednesday night, by sweeping Youngstown State 25-14, 25-17 and 25-10. Anna Brinkmann led the Norse with ten kills and 9 digs, while Miranda Wucherer finished with seventeen assists and 9 digs respectively. Head Coach Liz Hart said that she was pleased with the win and that the team has been focusing a lot on their serving this past week and feels like their execution on that helped them with Wednesday nights victory. The first set was dominated by the Norse as they managed to take an early lead and maintain it throughout the set. The Norse defense did very well to start the match by getting several blocks against the Penguins, as well as several digs to keep the Penguins kill statistics low. The Norse offense tallied 13 kills and only two errors on 25 attempts, one of which was by Brinkmann to finish the set. The final set was a blow out as the Penguins barely hit the double digit mark. The Norse defense only allowed six successful kills on 24 attempts, while the offense dominated with 15 kills on 29 attempts. Hardig led the set with four kills on five swings; while the defense was led by Haley Libs and Ashton Terrill who each had five digs. The Norse finished with 34 kills and a hitting percentage of of .365 while adding seven aces and seven blocks. The Norse will hit the road and return to action on Friday, Nov. 2 against the University of Illinois at Chicago. The Norse fell to the Flames in their last outing and are looking to start the final stretch of the season with a victory over their conference foe. “They beat us in five last time, so we want to get them this time,” Brinkmann said. The game is slated to start at 7 p.m. and will be broadcast on ESPN3.